What are methadone use signs and symptoms? Methadone use is dangerous because it can cause respiratory depression with first use. Like all opiates, there is the elevated risk of abuse and dependence and switching to more dangerous opiates like heroin. Physical use signs include pinpoint pupils, mental confusion, slow movement, and drowsiness. Behavioral changes may include going to multiple methadone clinics in different cities, switching to stronger opiates, and noticeable lifestyle changes. 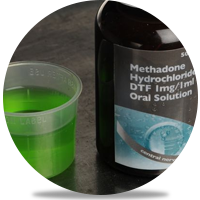 A synthetic opiate originally created for pain relief, methadone is most used for medication-assisted treatment. It is very effective for helping people reduce or quit addictive opiate drugs. Methadone reduces withdrawal symptoms and craving without the high. It also stays in the body longer, 13-50 hours, reducing the frequency of taking pills. Methadone use signs are like other opioids since it is a sedative as well as a pain reliever. The dosage of methadone depends on a person’s history with opiates. A typical dose for someone in medication-assisted treatment can be anywhere from 15-40mg per day. Under the supervision of a doctor, the dosage tapers down in a way that allows a person to quit using opiates without experiencing withdrawal. For those not dependent upon opiates, a dose of 10-60mg of methadone can produce a high. The high peaks within five hours and dissipates within 24 hours. As a pain reliever for severe chronic pain, the average dose is 2.5mg every eight hours. The pain-relieving effects typically last three to five hours. Methadone has the lowest death by overdose rate of any opioid, but the potential for overdose still exists. Like other opiates, methadone causes body systems to slow down. For those with opiate tolerance, without the euphoric high as a signal to stop taking it, some users end up taking too much. The respiratory system slows down and eventually stops, causing death. A single dose greater than a person is used to can cause respiratory depression to last for up to 48 hours. Do not take more than prescribed. Do not take it more often. Do not share medication with others. Notify your physician if you experience any adverse reactions including hallucinations, skin flushing, rash, itchiness, dizziness, irregular heartbeat, swelling, difficulty swallowing or breathing, or seizures. Physical dependence and tolerance to set in quickly. Those who abuse methadone will crave the substance and react physically to its absence. They will feel sick with abdominal cramps, constipation, shivering, sweating, runny nose and watery eyes like flu symptoms. In addition, they may feel muscle pain, joint pain, anxiousness, clammy skin and may complain of insomnia. A behavioral methadone use sign is the increase in drug seeking behavior and escalation of use. As the body develops a tolerance, it needs more to prevent getting sick from withdrawal and more to achieve the high. Methadone is most used at methadone clinics, and people who are misusing methadone may go to multiple clinics in multiple cities. Diversion is another technique used by people with a methadone problem. This is when someone with a legitimate prescription will get the drug and sell it to others for nonmedical purposes. Once this becomes too difficult or a person is not able to get the quantities necessary, they may switch to a stronger, more accessible opiate such as heroin. Switching to another opiate will also bring back the high. Eventually, however, tolerance to the stronger opiate develops, and drug seeking becomes a life focus. Methadone disperses better through oral administration than it does through injections, therefore the likelihood of someone injecting methadone is very low. If someone is demonstrating behaviors consistent with injecting drugs, it is likely they switched to heroin. As a person becomes consumed by the need to get more methadone, drug seeking becomes a compulsion. Life focuses on finding the drug, getting the drug, and using the drug. Switching to a stronger version comes with another set of behavioral changes. There may be injection-related materials visible, changes in locations where someone hangs out, changes in work, friends, and neglect of hobbies. Methadone use is dangerous because it can cause respiratory depression with first use. Like all opiates, there is the elevated risk of abuse and dependence, and switching to more dangerous opiates like heroin. Physical use signs include pinpoint pupils, mental confusion, slow movement, and drowsiness. Behavioral changes may include going to multiple methadone clinics in different cities or switching to stronger opiates. The compulsion to get and use them will lead to noticeable lifestyle changes.